Any homeostatic process that changes the direction of the stimulus is a negative feedback loop. It may either increase or decrease the stimulus, but the stimulus is not allowed to continue as it did before the receptor sensed it. In other words, if a level is too high, the body does something to bring it down, and conversely, if a level is too low, the body does something to make it go up. Hence the term negative feedback. An example is animal maintenance of blood glucose levels. When an animal has eaten, blood glucose levels rise. This is sensed by the nervous system. Specialized cells in the pancreas sense this, and the hormone insulin is released by the endocrine system. Insulin causes blood glucose levels to decrease, as would be expected in a negative feedback system, as illustrated in (Figure). However, if an animal has not eaten and blood glucose levels decrease, this is sensed in another group of cells in the pancreas, and the hormone glucagon is released causing glucose levels to increase. This is still a negative feedback loop, but not in the direction expected by the use of the term “negative.” Another example of an increase as a result of the feedback loop is the control of blood calcium. If calcium levels decrease, specialized cells in the parathyroid gland sense this and release parathyroid hormone (PTH), causing an increased absorption of calcium through the intestines and kidneys and, possibly, the breakdown of bone in order to liberate calcium. The effects of PTH are to raise blood levels of the element. Negative feedback loops are the predominant mechanism used in homeostasis. A positive feedback loop maintains the direction of the stimulus, possibly accelerating it. Few examples of positive feedback loops exist in animal bodies, but one is found in the cascade of chemical reactions that result in blood clotting, or coagulation. As one clotting factor is activated, it activates the next factor in sequence until a fibrin clot is achieved. The direction is maintained, not changed, so this is positive feedback. 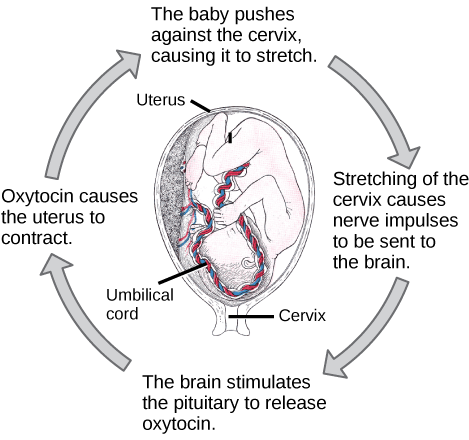 Another example of positive feedback is uterine contractions during childbirth, as illustrated in (Figure). The hormone oxytocin, made by the endocrine system, stimulates the contraction of the uterus. This produces pain sensed by the nervous system. Instead of lowering the oxytocin and causing the pain to subside, more oxytocin is produced until the contractions are powerful enough to produce childbirth. The birth of a human infant is the result of positive feedback. Changes can be made in a group of body organ systems in order to maintain a set point in another system. This is called acclimatization. This occurs, for instance, when an animal migrates to a higher altitude than that to which it is accustomed. In order to adjust to the lower oxygen levels at the new altitude, the body increases the number of red blood cells circulating in the blood to ensure adequate oxygen delivery to the tissues. Another example of acclimatization is animals that have seasonal changes in their coats: a heavier coat in the winter ensures adequate heat retention, and a light coat in summer assists in keeping body temperature from rising to harmful levels. 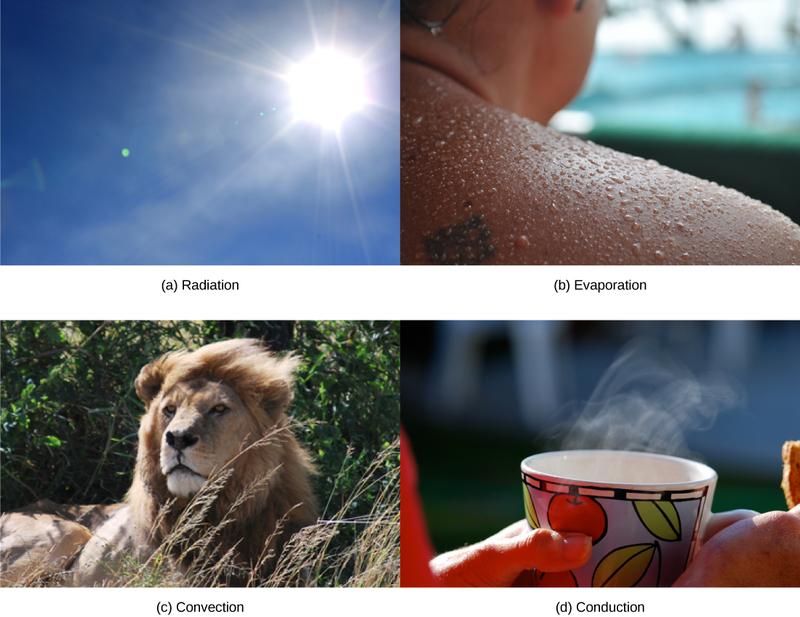 Heat can be exchanged between an animal and its environment through four mechanisms: radiation, evaporation, convection, and conduction ((Figure)). Radiation is the emission of electromagnetic “heat” waves. Heat comes from the sun in this manner and radiates from dry skin the same way. Heat can be removed with liquid from a surface during evaporation. This occurs when a mammal sweats. Convection currents of air remove heat from the surface of dry skin as the air passes over it. Heat will be conducted from one surface to another during direct contact with the surfaces, such as an animal resting on a warm rock. The nervous system is important to thermoregulation, as illustrated in (Figure). The processes of homeostasis and temperature control are centered in the hypothalamus of the advanced animal brain. 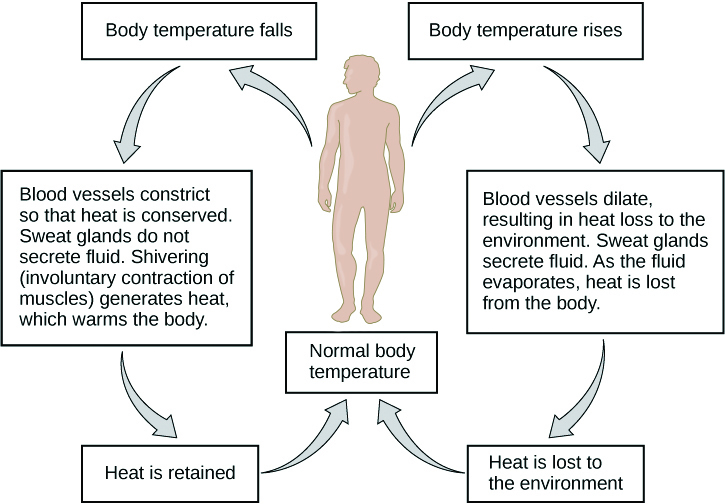 The body is able to regulate temperature in response to signals from the nervous system. Homeostasis is a dynamic equilibrium that is maintained in body tissues and organs. It is dynamic because it is constantly adjusting to the changes that the systems encounter. It is in equilibrium because body functions are kept within a normal range, with some fluctuations around a set point for the processes. (Figure) State whether each of the following processes are regulated by a positive feedback loop or a negative feedback loop. (Figure) Both processes are the result of negative feedback loops. Negative feedback loops, which tend to keep a system at equilibrium, are more common than positive feedback loops. (Figure) When bacteria are destroyed by leuckocytes, pyrogens are released into the blood. Pyrogens reset the body’s thermostat to a higher temperature, resulting in fever. How might pyrogens cause the body temperature to rise? (Figure) Pyrogens increase body temperature by causing the blood vessels to constrict, inducing shivering, and stopping sweat glands from secreting fluid. Which of the following is not true about acclimatization? Acclimatization allows animals to compensate for changes in their environment. Acclimatization improves function in a new environment. Acclimatization occurs when an animal tries to reestablish a homeostatic set point. Acclimatization is passed on to offspring of acclimated individuals. Which of the following is not a way that ectotherms can change their body temperatures? Adjusting the timing of their daily activities. Seek out or avoid direct sunlight. On a molecular level, how can endotherms produce their own heat by adjusting processes associated with cellular respiration? If needed, review Ch. 7 for details on respiration. Animals are capable of thermal uncoupling when they need to generate heat to maintain their body temperatures. In this process, an uncoupling protein provides a channel in the inner mitochondrial membrane that allows protons to leave the lumen without moving through the ATP synthase. This generates heat rather than chemical energy as the final product of cellular respiration. Homeostasis by OpenStax Biology 2nd Edition is licensed under a Creative Commons Attribution 4.0 International License, except where otherwise noted.